Tempura For Dinner, Oh My! You know that I think I’m Japanese, and I’m like, totally dragging Jay down that tunnel of disillusionment with me. 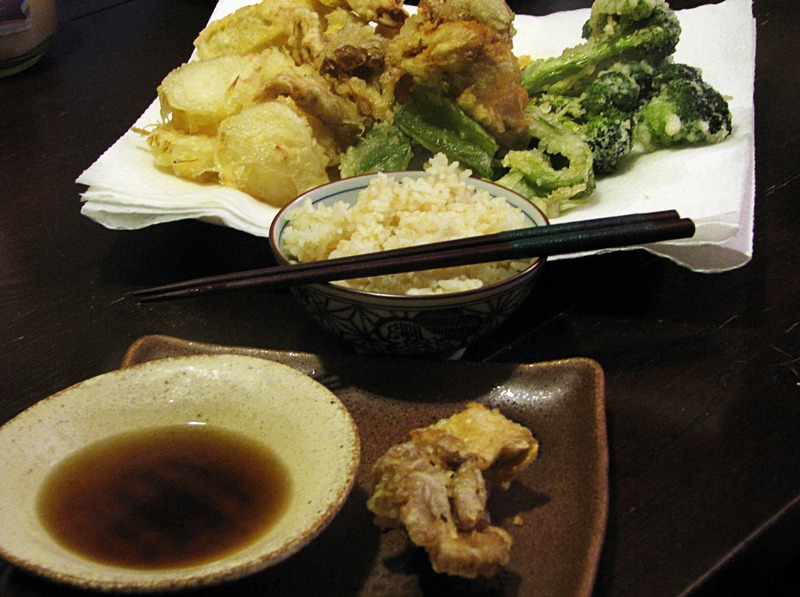 In Japan, tempura is served all the time, from one piece in lunch boxes to as a full meal with just rice and dipping sauce for dinner. The whole meal option is my favorite. When I studied abroad in Osaka my host mother would have tempura night when she needed to get rid of a lot of ingredients. She’d fry ANYTHING, and it was a blast to watch and eat! I don’t do it often, but this is a great fun way to eat some fried foods and veggies all at the same time. It’s easy, too! 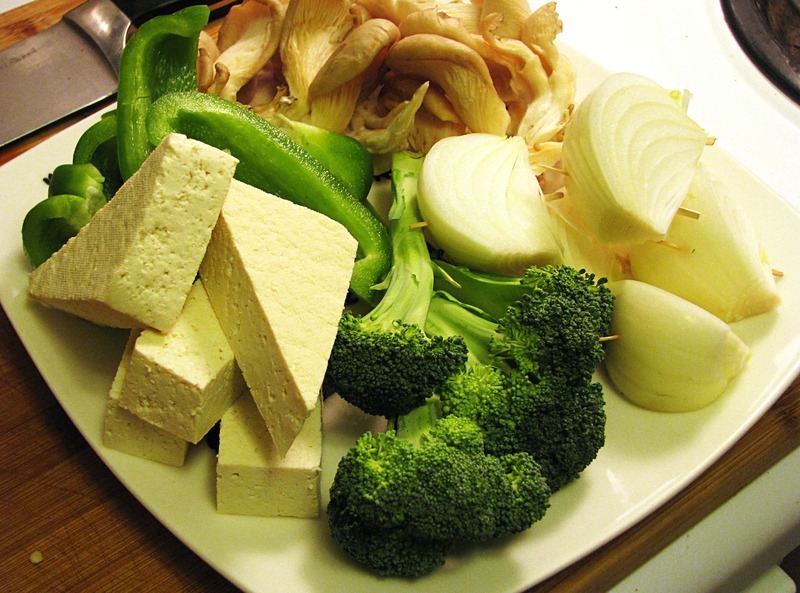 assorted veggies and protein – enough to serve the people who will be eating! I use different veggies all the time, but I find it easiest to have 3 or 4 veggies to choose from and one or two lean proteins – shrimp and tofu are my favorites, but you could use very thinly sliced chicken, pork, or beef too! 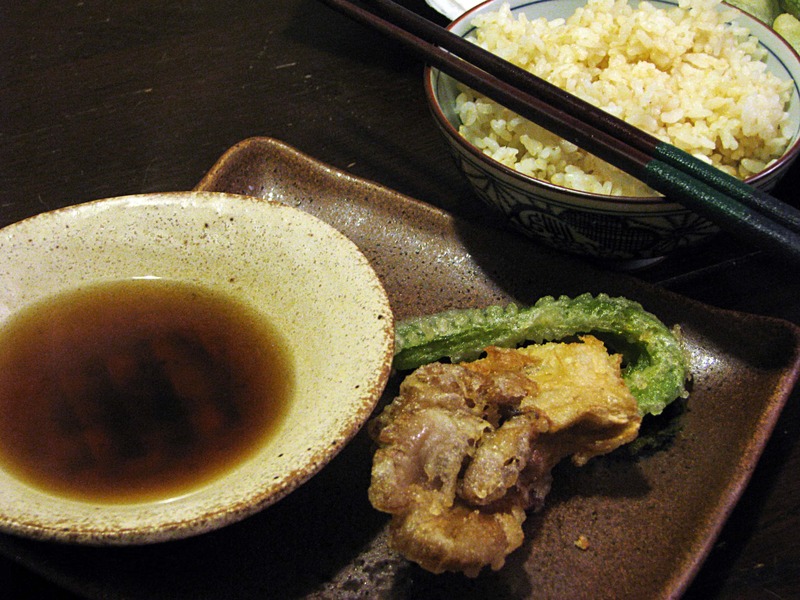 Very first, I start the rice and make the tempura sauce, which is SUPER DUPER EASY. Seriously! First, measure whatever fish-flavored water-concoction you’re using. 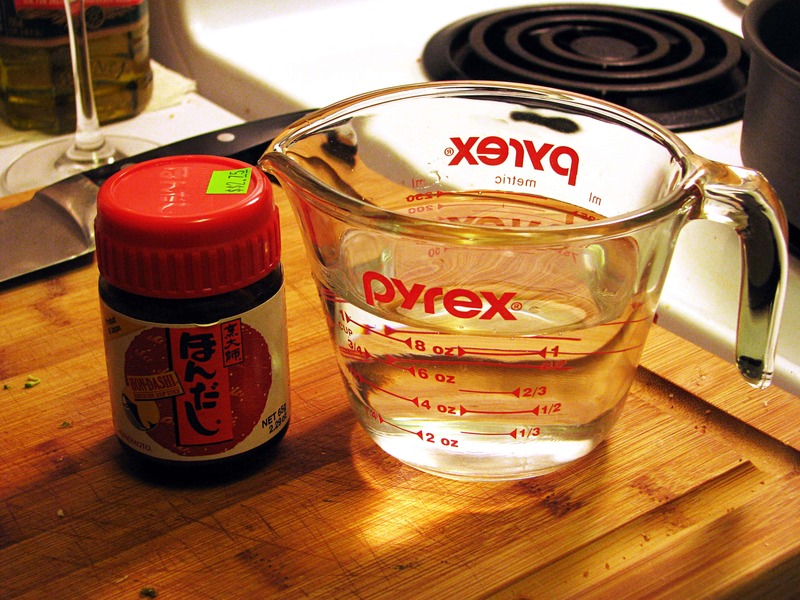 The dissolving dashi is great to keep around the house if you’re weird like me! 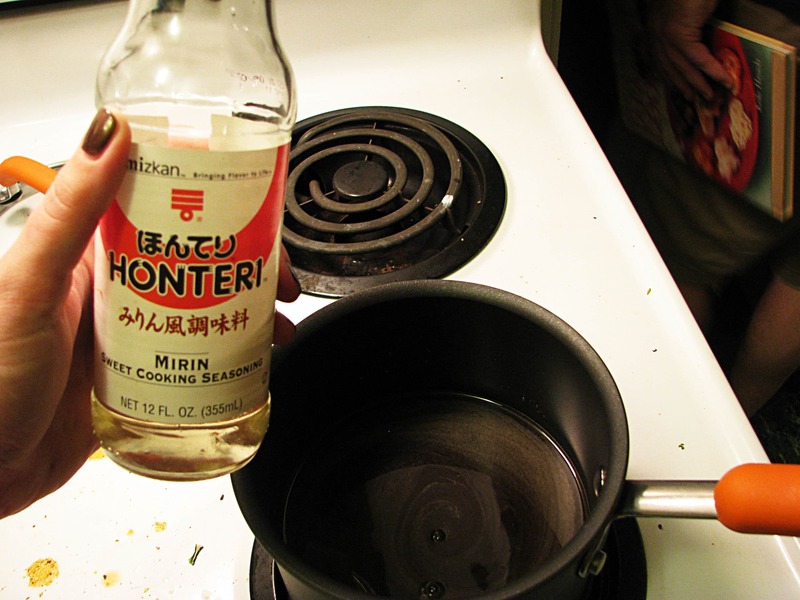 Pour the flavored water into a small pan, then add the soy sauce and mirin. Excellent! 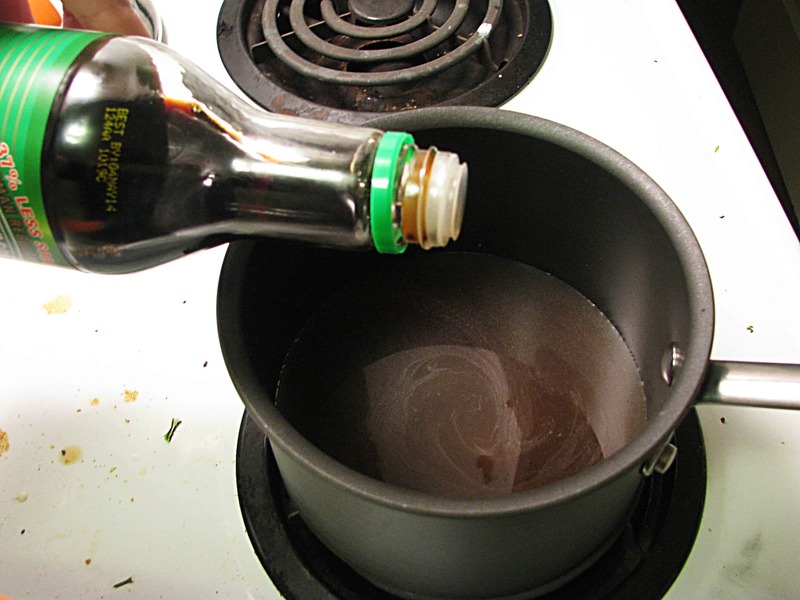 Now, put a lid on the pot and turn the stove to low – the sauce will slowly warm while you fry the tempura. 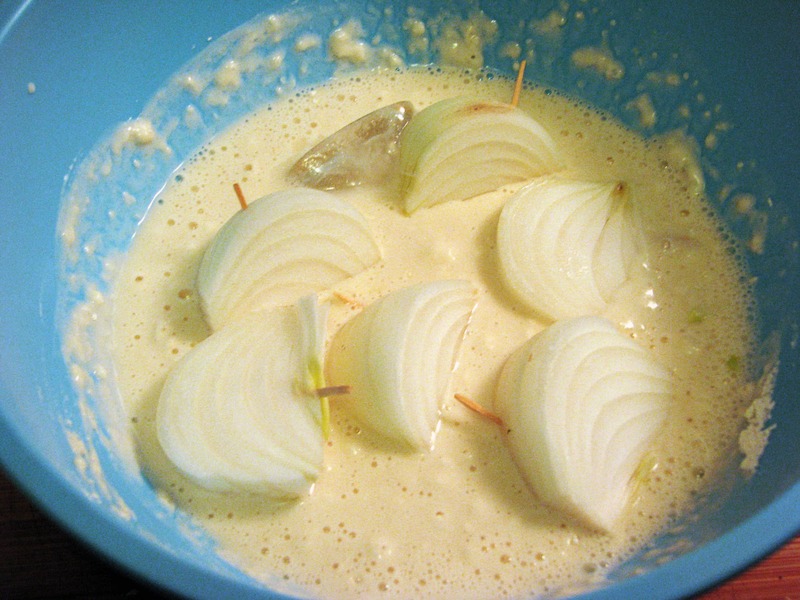 Once the sauce is started, I get all my ingredients ready while the oil heats up (turn it to medium and let it heat through to about 350F) and have them ready on a plate – large chunks are easiest to fry, and stick a toothpick through onion wedges so they don’t fall apart in the batter! 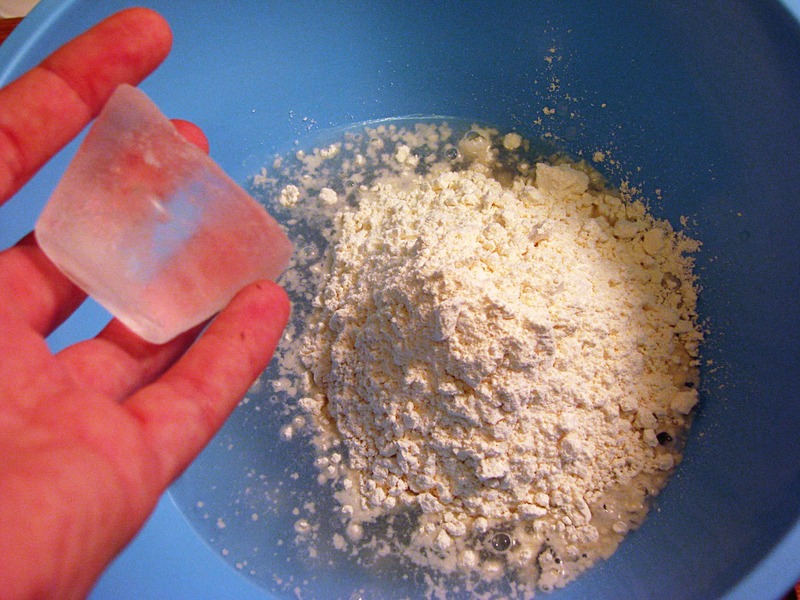 For tofu or any other meat, pat them dry with paper towels so more batter will stick to them. Doesn’t that look just great? Sweet potatoes, carrots, asparagus, and green onions are great too – really whatever veggies you have! 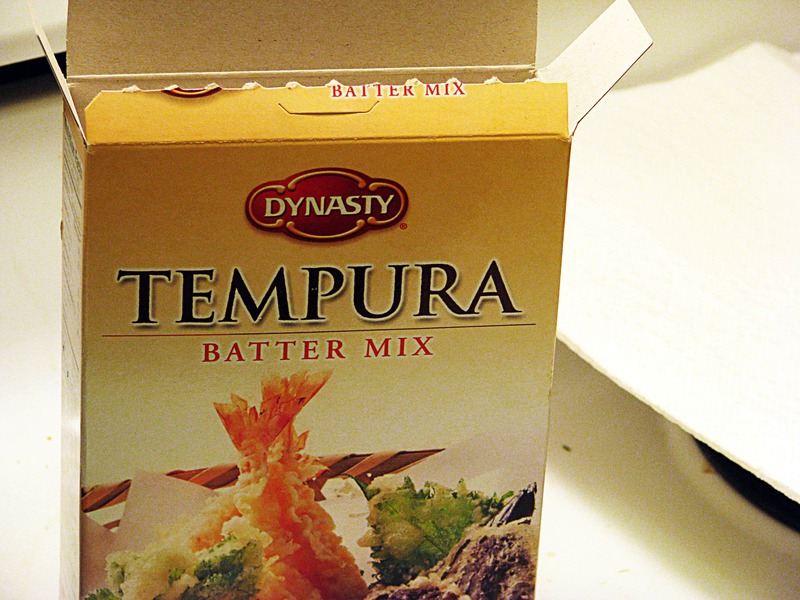 For the tempura batter, I use a mix, like this one. There are easy recipes that involve soda water and rice flour, but I find this to be easy and 89% authentic tasting, so why the heck not? For just me and Jay I used half the box. 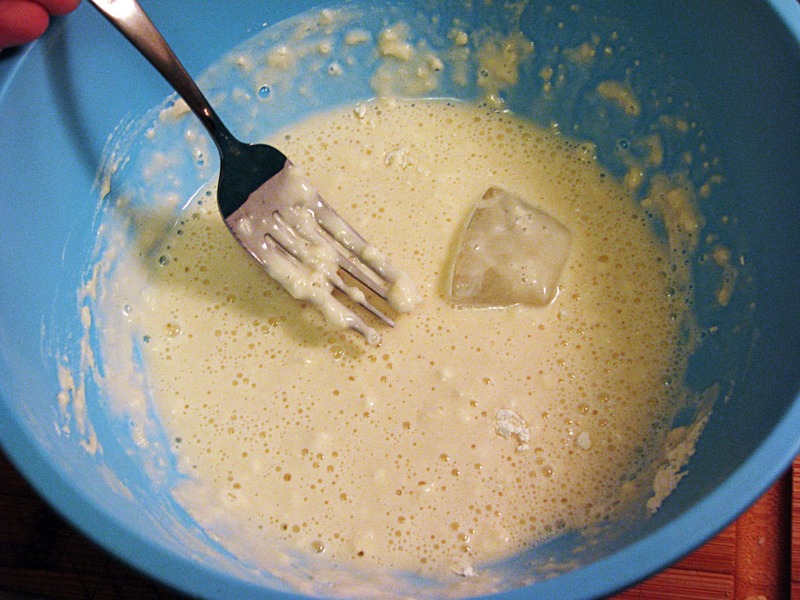 Depending on what the instructions say, you mix the appropriate amount of water with the flour, but just barely – it’s ok if the batter is lumpy! Then, you drop in one ice cube. I have no idea why – feel free to tell me if you know! It’s a thing, though, do don’t skip this step! If you aren’t using a thermometer for your oil, you can sprinkle a few drops of batter in the oil – if they bubble and crisp, you’ll know the oil is hot enough! 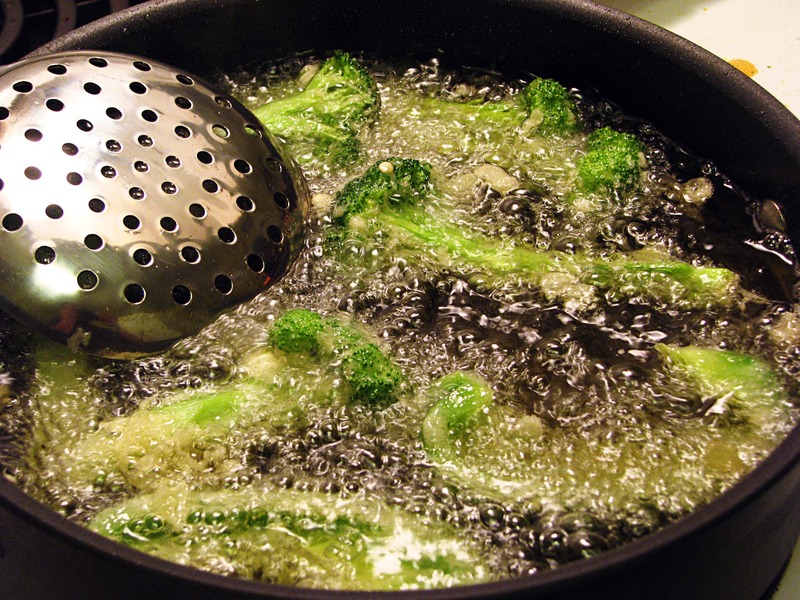 In batches, dip all your veggies into the batter and carefully lower them into the oil. Don’t crowd the pan! If you’re doing lots of tempura you could heat up two pans with oil and let everything go at once. 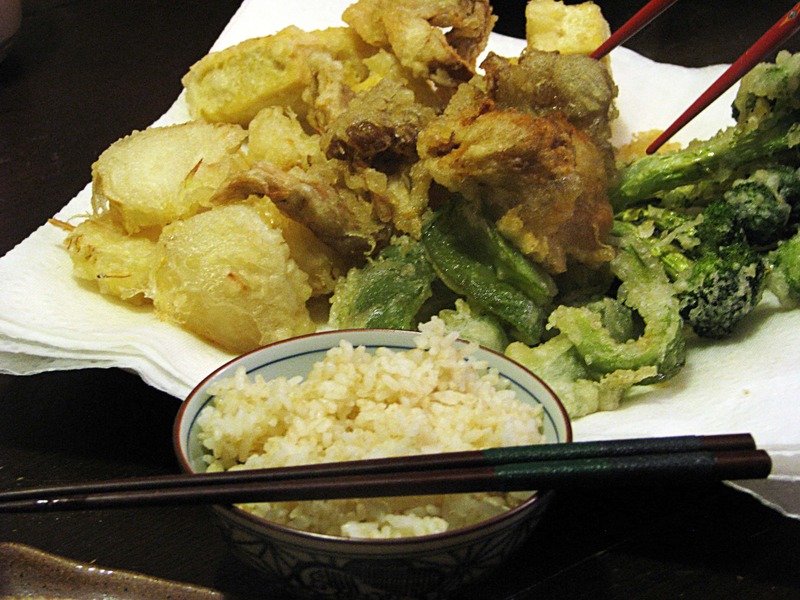 The oil should continually bubble around the tempura pieces. Doesn’t that look delicious? 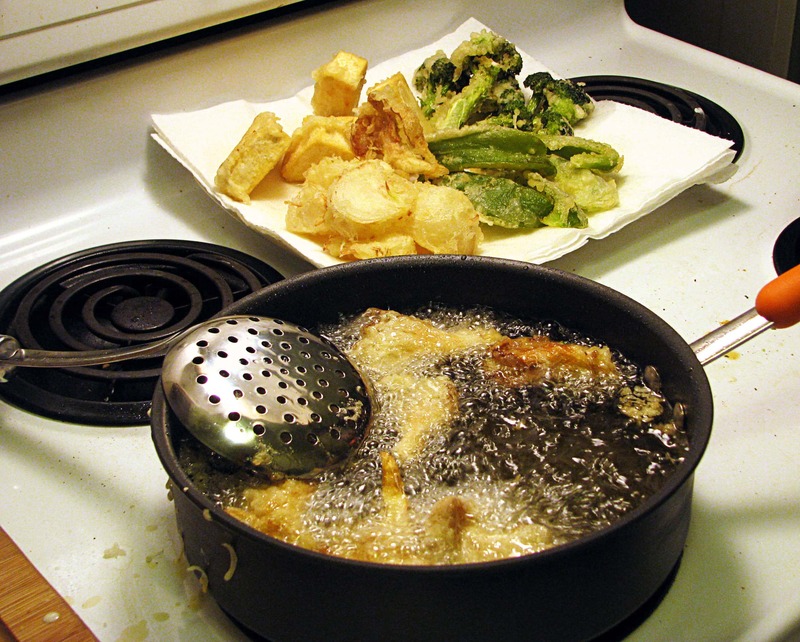 Each batch of tempura should fry for 5-7 minutes until the batter is firm and slightly golden – it won’t get very dark like some other fried foods. Remove the pieces when they’re done to a plate lined with lots of paper towels. See? Just keep frying and stacking until it’s all done! You can also put the pieces on a cooling rack and into a low oven to keep them warm if you’re doing more than 4 or 5 batches. Look at all that yummy tempura! To serve, I make a small bowl of rice for everyone and a small bowl of dipping sauce. Then I give everyone a pair of chopsticks and a small plate, then put the large plate of tempura in the middle of everything. 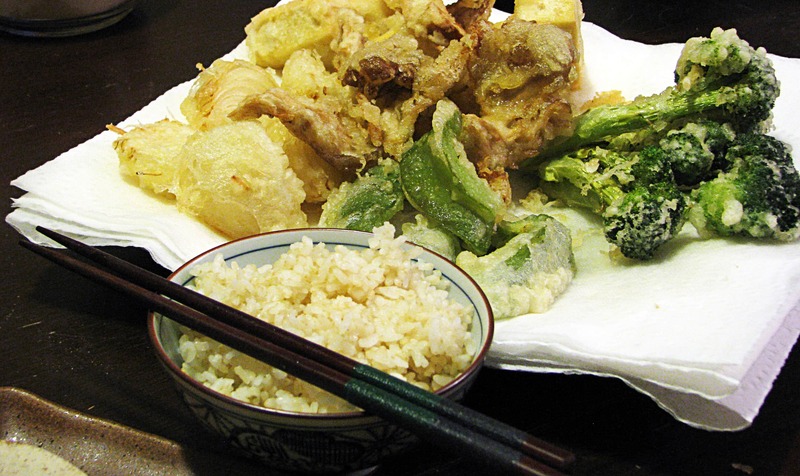 This way people can just grab the pieces of tempura they want as they eat – it’s fun and family style! Oyster mushrooms are definitely my favorite. If you’re using the radish or daikon, finely grate it into the sauce right before you serve. It adds a great spiciness and freshness – I just didn’t have any this particular night! Enjoy this, guys! It’s a fun, easy, SPECIAL entertaining or group idea that’s always a hit! Grab some sake and you’ll be set for the whole night. Plan a tempura night soon! 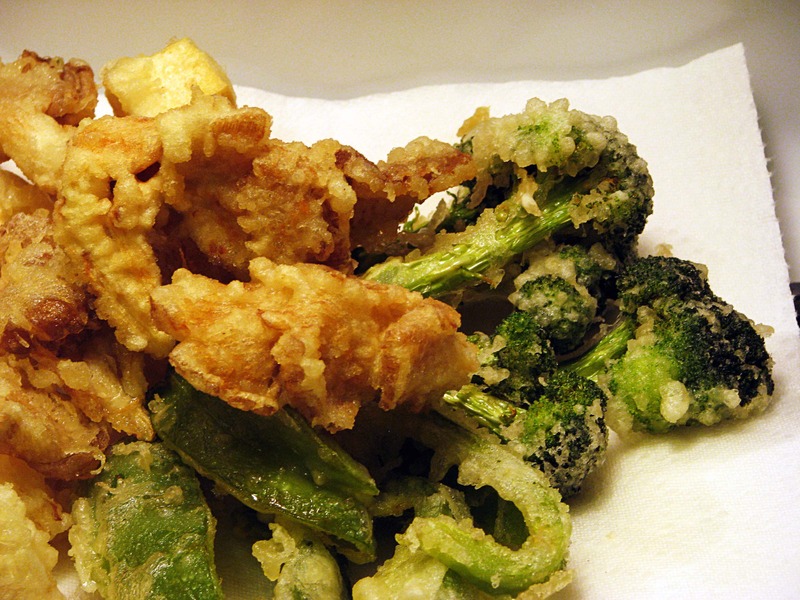 I love tempura but have never made it. I’ve read other recipes that say you should really use super cold fizzy water but from your recipe, looks like an ice cube works just as well. Cool! You’ll love it! Its so much fun.